What does a field guide that has conservation as its goal look like? What does a field guide that covers one of the most biologically diverse countries look like? 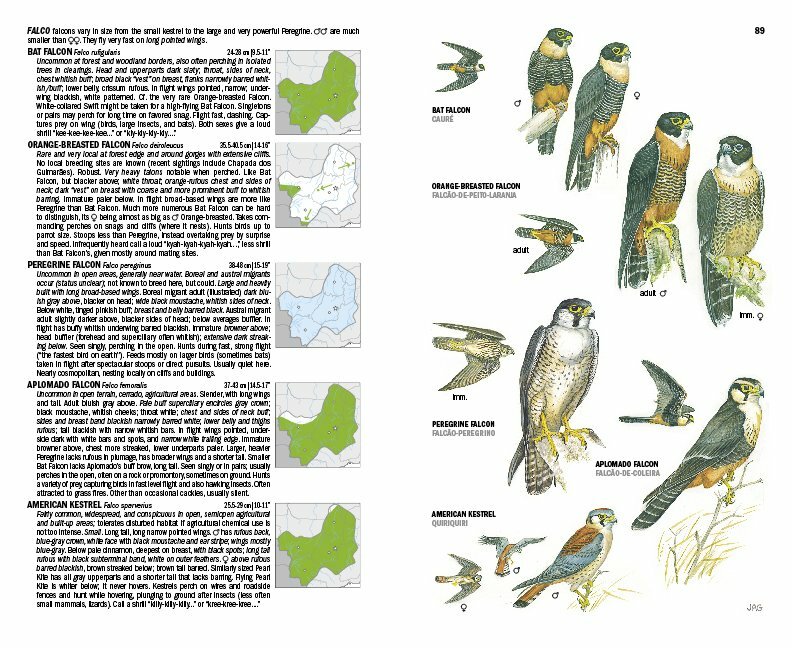 What does a field guide that brings together John Gwynne, Robert Ridgely, Guy Tudor and Martha Argel look like? It looks beautiful. It looks wonderful. It looks useful. And it looks even better in my hands while I dream about a visit to regions of Brazil I had scarcely heard of before being provided with a review copy of the first volume of the Wildlife Conservation Society Birds of Brazil. * Because Brazil’s avifauna is so large and diverse, with many species only occurring in very specific habitat, and because one of the goals of this enormous project is to get Portuguese language books into the hands of Brazilians so they can use them in the field, the Wildlife Conservation Society Birds of Brazil will be published in five volumes, each of which will focus on different regions. 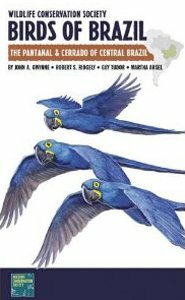 ** The first volume, which is the only one to be released so far and which is therefore the only one being reviewed here, focuses on “The Pantanal & Cerrado of Central Brazil.” Don’t be intimidated if you don’t know what the heck that means because I really didn’t either but this amazing book explains it all. The first twenty-nine pages of the book, after the acknowledgements, table of contents, and other prefatory materials, are devoted to the Pantanal and Cerrado and the need to conserve these two endangered biomes. Lavishly illustrated with landscape and habitat photographs, maps, and small bird paintings, it is a great read and prepares the reader for a visit to either or both regions. Briefly, the Pantanal “is a seasonally flooded wetland covering more than 80,000 square miles” and the Cerrado is “a distinctive Brazilian habitat as well as one of the planet’s biologically richest savannas.” Both are under threat from a variety of interests, and those threats and possible solutions that would allow at least some of the habitat to be conserved are discussed. The conservation need is urgent: great attention has rightly been paid to Brazil’s Amazonian rainforest but not enough resources have gone to the Pantanal and the Cerrado, of which only 4% and 5%, respectively, are protected. This opening section of the book is excellent in and of itself but this is a field guide so I must, obviously, speak to the book’s merits as a tool for identifying birds. Having never been to Brazil I can’t possibly speak as an expert in terms of what birds are covered or how well species that I have never seen are depicted. The birds that I have experience with, like some of the raptors, wading birds, shorebirds, and tanagers, are all true-to-life in color, shape, and proportions to say nothing of being pretty paintings, if slightly sterile on the standard plain white background. The passerines are rearranged reprints of Guy Tudor’s plates from several of the field guides he has authored with Robert Ridgely, which means that they are absolutely awesome to look at and drool on while dreaming of seeing the birds on the plates in the flesh. He also served as art director, and other plates were painted by a host of spectacular bird artists including Dale Dyer, Michael DiGiorgio, and John Gwynne. Though other guides that use multiple artists have failed at least in part because of the jarring differences in style, this guide manages to make it work, both because of the consistently high standards and because the artwork was broken down by family so that, for example, John Gwynne did the raptors, Sophie Webb did the nightjars, and Jan Wilczur did the hummingbirds. 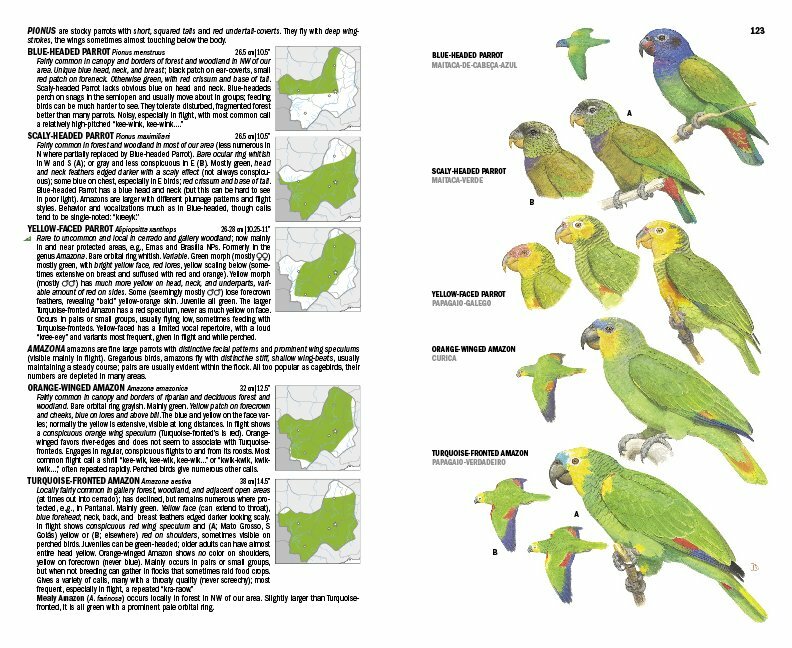 Most amazingly, the guide can actually be carried into the field despite the fact that the publisher did not skimp on quality or cram too many birds onto each page, a rarity among field guides that focus on the birds of the neotropics and a tribute to Terry Clarke’s excellent design work. It’s wonderful to have a guide about neotropical birds with both the descriptions and the map on the page facing the plate. Each species is identified by both the English and Portuguese common names, a huge help considering that the average Brazilian is unlikely to be able to help you find a bird if you don’t know what it is called in Portuguese. Of course, a Portuguese language version will soon be published as well, so if you really want the help of the average Brazilian in finding birds it couldn’t hurt to bring a copy or two of that version to leave in the hands of those who help you find birds. By encouraging Brazilians to learn about their avifauna you’ll be helping conservation while acting in your own self-interest. Talk about a win-win! The species accounts are written by Robert Ridgely, one of the premiere neotropical ornithologists, and a veteran at writing excellent field guides. The accounts are as good as you would expect and include information on appearance, habitat, behavior, and vocalizations. Each family of birds has a short introductory paragraph and most genera get a sentence or two of description. I realize that I am repeating myself here but it is absolutely great to have the species accounts right there next to the plate: the layout will undoubtedly help novice neotropical birders get a grasp on the birds much more rapidly then they would if they were using the typical huge field guide of the neotropics where the accounts are in a different section or even a different volume. The one major drawback to this book is actually an intended feature and not a glitch. 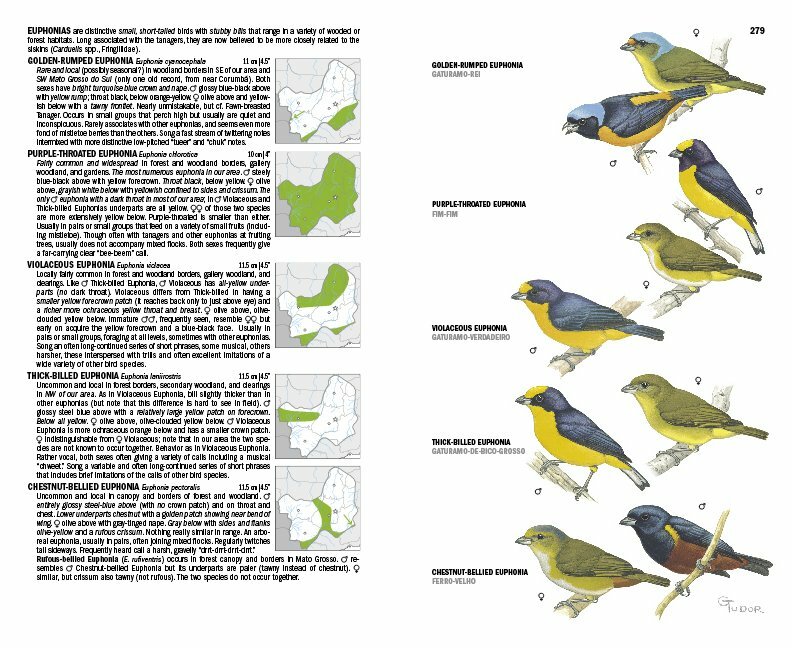 The book only covers the birds found in the Pantanal and the Cerrado and only shows those regions in the range maps. If you are birding other parts of Brazil you will need other field guides and until the other four volumes of this set come out you will have to make do with guides of a lesser quality. Of course, the 740 species in this book are more then enough to last even the most avid of birders until the much-anticipated (at least by me) next volume is released. This field guide is an achievement and I can’t wait to see the next four in the series. 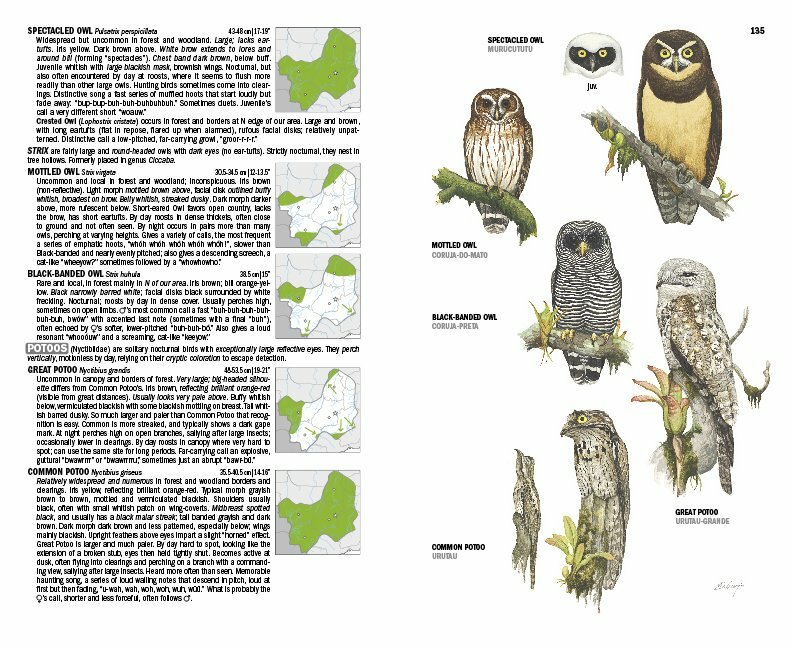 Most books by committee fail because of a lack of a unifying vision but the large team that worked on this field guide seems to have managed to pull off the difficult task of combining artwork by numerous artists, range maps, well-written species accounts, and information on habitat and conservation in an attractive and usable package. If you are planning a trip to the Pantanal or the Cerrado or if you are like me and just daydream about undertaking such a trip you should undoubtedly go out and get yourself a copy of Wildlife Conservation Society Birds of Brazil – The Pantanal & Cerrado of Central Brazil. *Full disclosure: I was provided with a review copy and a signed copy was provided to give away on 10,000 Birds so keep an eye out for that fun prize! I also know Terry Clarke and Guy Tudor. **Because I do not speak or read Portuguese and because the Portuguese version has not yet been printed (it will be shortly) I was provided with the English version. How Many Birders Are There?